The proposals being discussed were formed partly off of the results of that survey. The attached shows what I'm talking about. Note that in this area, eastbound GWMP is lower than westbound GWMP - the blue line would be the trail, and while it looks like it crosses eastbound GWMP, it just goes under it. 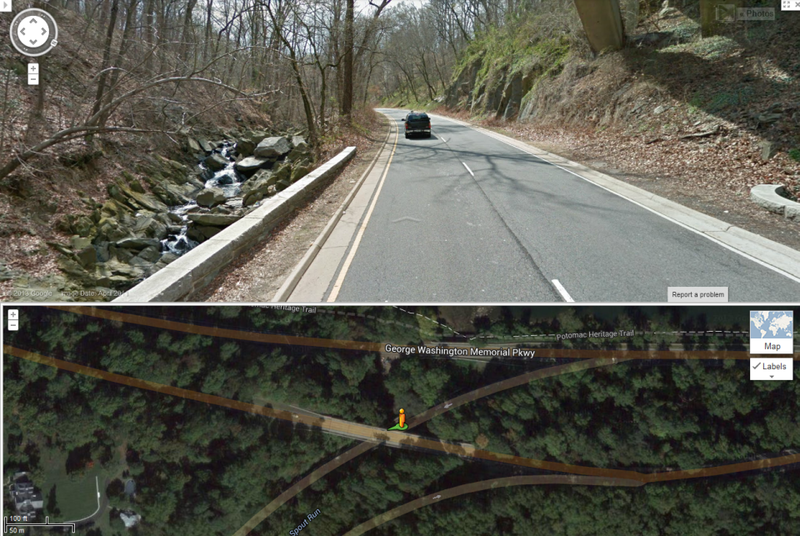 Basically it would be a two way path/cycletrack along the south/west side of Spout Run then the GWMP then the ramp to Rosslyn. 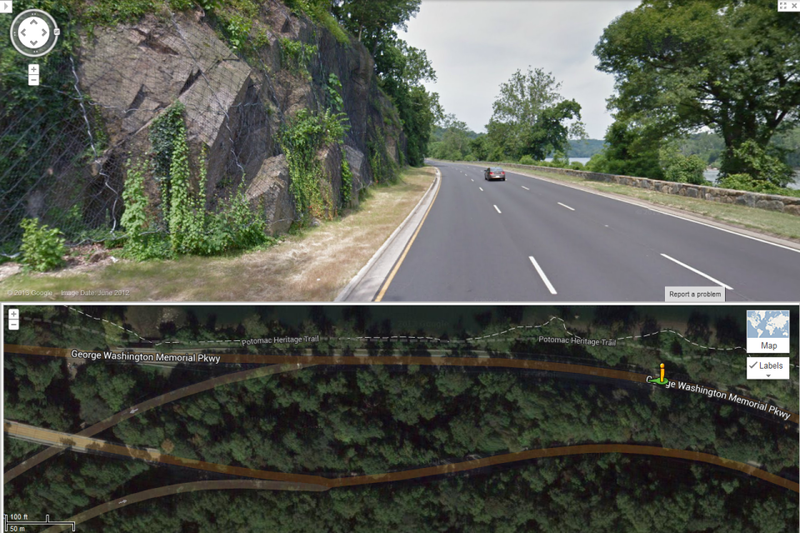 This isn't a path along the Potomac (which I believe was recently discussed as too expensive / too environmentally destructive / too historical viewshed-destroying). I actually saw this path in an OLD master plan -- wish I had noted which one. Most of it would be easy to build -- I believe there's plenty of width on the ramp to Rosslyn and along the GWMP. The issue would just be along Spout Run and getting it back to Lyon Village, but there are options. I would expect Bike Boulevard treatment for Key Blvd, at least in Lyon Village, but here I'm focused on getting from the Lyon Village part to the Rosslyn part. I see no reason why you couldn't suspend a bridge over the ravine there, smoothing out that path, and improve the entrances to the path to make it clear that this is a real transportation connection. On the Rosslyn side, you currently bike through this odd parking lot thing, and it's hard to find. If you extend 18th, it might be better to route the trail there, so 18th ends in a nice transition to path, just like Key Blvd does on the other end. In the afternoon rush hour times, I often ride past the carillon and up the ramp around Iwo Jima, using the curb cut and merging with northbound traffic on North Meade, then make a left on Arlington Blvd (access rd). One improvement they could make RIGHT NOW is to align the curb cut with where the trail comes up, so that bikes don't have to ride on that NARROW sidewalk. It's not the hugest deal, but there are often tourists up on the sidewalk at the top of the hill, leading to this weird "excuse me, I'm going there" dance. Not saying it's unworkable; no bike route anywhere is a cakewalk. At one point the Intersection of Doom had a bunch of redesigns. I think they may have been official. Like tunneling the bike path underneath.... and some other options. Does anyone know where that documentation is? Would probably be good to have for this discussion. Even a year or so ago, I remember big promises that the solution was right around the corner. Any documentation of what that solution - which did not materialize - was? Again, the prob of the Intersection of Doom is not so much design as it is five jurisdictions that must get on board the solution: Arlco, VDOT, NPS, Priv Prop, and even DC I understand. That web page links to both the Esplanade Study and the Rosslyn Circle study which both have looked extensively at the problem (in various ways) and have some longer-term options. I have an email into Arlington's Capital Projects manager asking for an update timeline on the Esplanade project as it is WAY behind the original schedule. Chris, The 90% engineering plans are scheduled to go to VDOT in January. This a behind the web page schedule and we will again be updating. I will additionally be adding in some new photos of the custom fence posts and some new details of bridge design. We had a contract dispute with the design consultant regarding new task fees and current scope. This set us back about 5 months I am sorry to say but it has been contractually resolved and all parties are back at work. So I proposed the above, someone asked for an example of what I was talking about and I've been thinking about it ever since. Then I saw this. The one labeled "Sloping curb in Portland, Oregon" (most of the way down) is what I envision.